Vintage, late 1950's, 12 3/4" X 10 1/4" UNION PACIFIC RAILROAD COLOR ART PRINT. A print on each side. One with the train and on the other side a view of the inside of one of Union Pacific's trains. 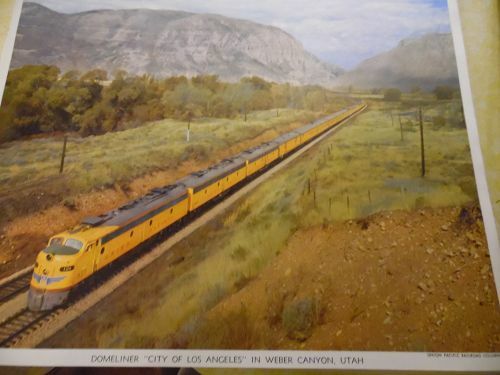 This one titled "Domeliner"City of Los Angeles" in Weber Canyon Utah". On the flip side "Colombia River Gorge from one of Astra Domes on Domeliner "City of Portland" Excellent condition and ready to frame. I have 2 of these. price is per print.